Comic Art Friday: Hey, I know that guy! I don’t remember how many years I’d been reading comics before I could distinguish the work of one artist from another. Given that I started reading comics as a first-grader, I’m guessing that recognition took quite a while. But by the time I was thinking about comics critically — say, around age nine or ten — I could readily spot certain artists with distinctive styles, and could form preferences for one creator’s work over another’s. At Marvel, the concept of “house style” was practically nonexistent. Even though Kirby’s powerful action scenes set the standard, none of the other Marvel artists were forced to ape the King precisely. In fact, the three artists who formed Marvel’s core talent in the mid-’60s — Kirby, Steve Ditko, and John Romita Sr. — all drew quite differently from one another. Kirby’s art was muscular, propulsive, in-your-face bold; Ditko’s was stiff, quirky, and often fantastical; Romita’s sleek, prettified approach reflected his many years drawing romance comics. As Marvel grew into the next decade, the company continued to add artists to its stable whose work immediately stood out from everyone else’s. From a young age, I could identify the splayed hands, twisted posture, and bizarre up-the-nostrils facial perspective of Gil Kane; the statuesque, graceful, almost neoclassical anatomy of John Buscema; the fine lines and haunted eyes of Jim Starlin’s characters; the intricate detail of Barry Windsor-Smith. Ditko’s Spider-Man looked nothing like Romita’s or Ross Andru’s or Kane’s, or any of the others who followed him (not to mention Kirby, who — at the risk of speaking sacrilege — couldn’t draw Spidey very well at all), and Marvel seemed okay with that. Among the first artists whose work I could pick out of a lineup was Herb Trimpe, who throughout the late ’60s and early ’70s was the regular penciler on The Incredible Hulk. Trimpe’s style had a unique, almost Ditko-esque angularity, particularly when it came to faces, that no one else possessed. His Hulk more or less became the template for the character. Much as when I close my eyes and think “Batman,” I envision the Caped Crusader as drawn by Neal Adams or Jim Aparo, or when I think “Iron Man,” I see George Tuska’s or Bob Layton’s, the definitive image of the Hulk in my mind will always be Herb Trimpe’s. The 2005 Common Elements commission by Trimpe seen at the top of this post was one of my earliest “big scores” as a collector, in terms of commissioning an artist of whom I’d been a fan since childhood and whom I regarded as a “big name.” Even now, I don’t think I have another commission by an artist whose work goes back as far in my memory. 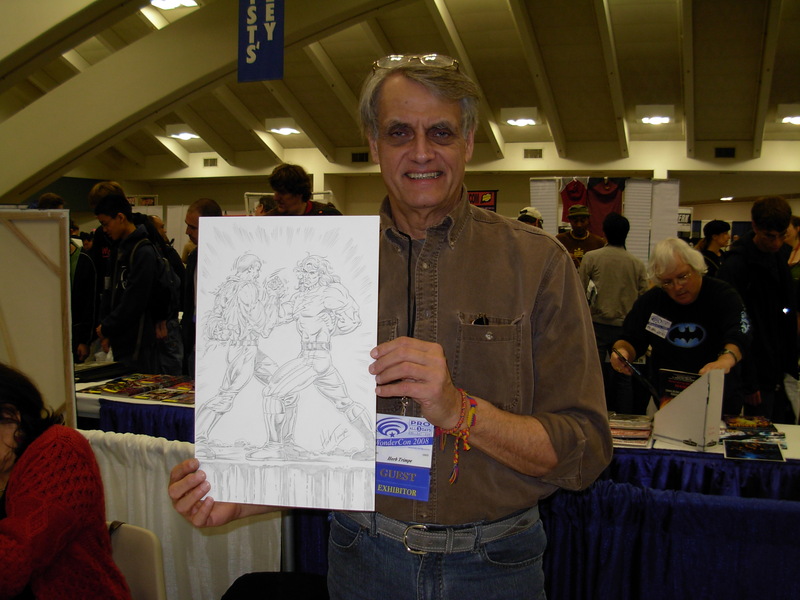 I’ve been fortunate to commission several other artists I enjoyed in my youth, but probably none earlier than Trimpe. At the time of this commission, I thought it would be fun to have Herb draw Doc Samson, a Hulk supporting character he co-created with writer-editor Roy Thomas. (Why not the Hulk? you ask. Because everyone asks Herb to draw the Hulk, I reply.) Of course, the natural Common Elements pairing would be another Doc — Savage, of pulp, comics, and kitschy ’70s film renown. Herb threw me for a loop, though, when he asked me what I wanted the characters to be doing in the drawing. As longtime Comic Art Friday readers know, I prefer to allow artists I commission to dream up their own scenarios, figuring that their ideas will almost invariably be superior to my own. But, since Herb asked, I suggested the arm-wrestling bit. This remains one of just a couple of Common Elements pieces in which I had any input into the scenario design, beyond selecting the characters and artist. The only others that come to mind are Bob Budiansky’s Ghost Rider / Batgirl matchup, and Gene Gonzales’s “Catfight of the Bands.” Even in those pieces, everything beyond the one-phrase concepts “motorcycle race” and “battle of the bands” came from the imaginations of the respective artists, not from me. Some three years after this commission was completed, I connected in person with Herb at a local comics convention. It was a rare treat to be able to thank him, face to face, both for this particular artwork and for all of his creations that I’ve enjoyed over the years. Herb even posed with his masterpiece for this photo. There’s an interesting sidelight to the Herb Trimpe story. Herb worked for Marvel for a phenomenally long time, spanning the mid-1960s into the 1990s. Late in his Marvel tenure, his drawing style changed rather drastically, reflecting the line-intensive approach favored by then-popular artists such as Todd McFarlane, Jim Lee, and Rob Liefeld. Opinions differ as to whether Trimpe evolved his style on his own, as artists frequently do — think of Picasso’s many “periods,” for example; or, to choose a comics-related parallel, the stark switch in Bill Sienkiewicz’s style away from its early Neal Adams influences to something bordering on abstract — or whether he was pressured by Marvel editorial to stop drawing “old school” and come up with a more “up to date” look. I don’t know which is true; perhaps the reality contains an element of both. As you can see in the drawing featured here, Herb’s recent approach is an amalgam of classic Trimpe and his latter-period comics work. That, too, is probably for the best. Comic Art Friday: Hello, young lovers! Let’s be honest: This whole Valentine’s Day business is kind of silly. It’s a holiday so bogus that even the Roman Catholic Church — an organization that never passes up an opportunity to invent a holiday — took it off its official calendar way back in ’69. (I hear you snickering. Stop.) For the most part, Valentine’s Day continues to be perpetuated primarily by commercial interests — the See’s Candies, Vermont Teddy Bears, FTD Florists, and Hallmark Cards of the world. But hey… it’s about love. Who doesn’t support love, am I right? So, in honor of romance on this Valentine’s Day, let’s root through the galleries and cull out a few great images of loving couples from the comics. Probably my favorite superhero love story of all time is that of Wanda Maximoff, the Scarlet Witch, and the android Avenger known as the Vision. This unlikely pairing — the passionate Wanda and the cool, distant Vision — made for some terrific storytelling during the Bronze Age. Here, Geof Isherwood — one of the industry’s most underrated artists, in my opinion — takes a rough preliminary sketch by the legendary Frank Brunner and transforms it into a dynamic work of finished art. Among the best romantic matchups of superhero and civilian was the longstanding marriage of Peter Parker, your friendly neighborhood Spider-Man, and vivacious Mary Jane Watson (eventually Watson-Parker). I know a lot of fans preferred Peter with Gwen Stacy, but Gwen always seemed kind of dull to me. (The icy blondes typically are, unless you’re Alfred Hitchcock.) MJ was the kind of girl who would keep life interesting… which is why Peter married her, I think. I commissioned this beautifully drawn piece from New Mutants co-creator Bob McLeod. The Superman-Wonder Woman romance was never really a thing in the actual comics until relatively recently. I’m still not sure that it works, but I do love this drawing — penciled by the late, much-missed Mike Wieringo, and inked by Richard Case. Batman and Catwoman can’t decide whether they want to be a couple or not. At various times during the past several decades, their relationship has ranged all over the spectrum. 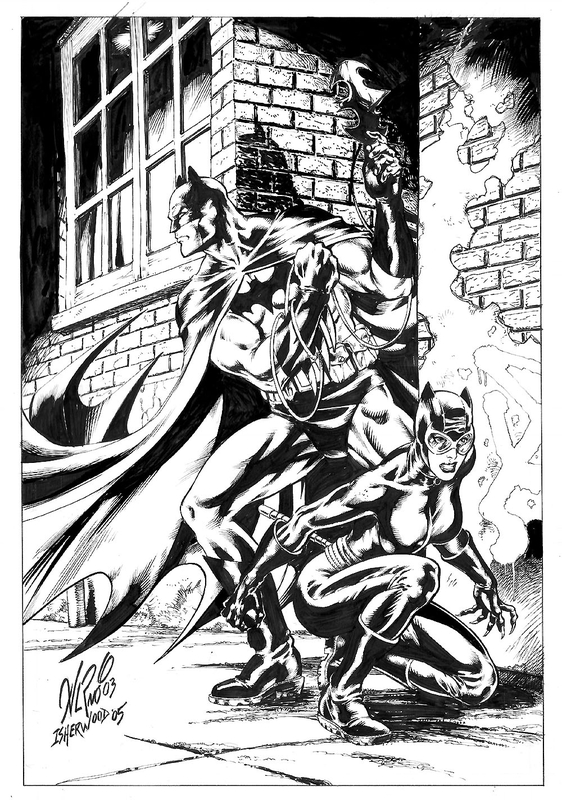 Still, there’s probably not another pairing in comics with more raw intensity than Selina and Bruce. They’re captured here in a working moment by another monumental talent we lost too soon — Al Rio, with inks by Geof Isherwood. The love affair of Green Lantern John Stewart and Hawkgirl originated in the DC Animated Universe, by way of the Justice League TV series. So far as I know, this relationship hasn’t crossed over to the comics page in a major way. For me, though, it remains one of the highlights of the DCAU lexicon. Wielding the pencil and pen here is artist Wilson “Wunan” Tortosa. You’d have to be as ancient as I am to recall the days when the THUNDER Agents made their first foray into the spinner racks. Dynamo, the sometimes lunk-headed leader of the THUNDER crew, had an ongoing love-hate relationship with the villainous Iron Maiden (no relation to the heavy metal band of the same name). The duo gets wrapped up in a fighting clinch — or a passionate embrace; you be the judge — in this gorgeous tonal-pencil creation by Geof Isherwood. Friend reader, I hope that wherever you find yourself today, you’ll take a moment to let those you love — romantically, familially, platonically, or otherwise — know that they’re special to you. To quote an old Don Henley tune, there’s just not enough love in the world. So get on that, will you, please? Here’s my personal Valentine shout-out to the two ladies in my life: my beloved Pirate Queen, and my pride and joy, The Daughter. I love you both — in your own unique ways, of course — truly, madly, and deeply. And that’s your Comic Art Valentine’s Day.